While the dating of oil paint's origins are still under scrutiny, the technique of oil painting became widely popular during the fifteenth century. The medium, which revolutionized painting, supplanted the previously popular medium of tempera paint and afforded artists with greater versatility in their compositions in terms of the coloristic effects they could convey. Setting his figures against an impressive gilded backdrop, Duccio showcased a uniformity of color while also featuring the crisp patterns characteristic of works emerging from the medieval aesthetic. Artists since the fall of Rome had made pattern and texture a key component of their paintings, thus making the capability to manifest such pattern in tempera an ideal pairing. For some artists working in the Italian peninsula, the technique of tempera reigned supreme well into the fifteenth century. One can look to Florentine painter Sandro Botticelli as a prime example. 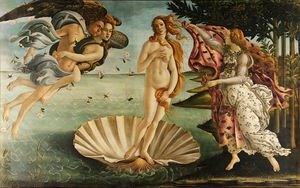 He is perhaps best known for his iconic duo of Primavera (1482) and The Birth of Venus (circa 1486), both tempera on canvas compositions that showcase the depth of color possible with the medium. One can also note that, similar to his predecessor Duccio, Botticelli continued to reinforce the crisp and clear contours of each compositional element. 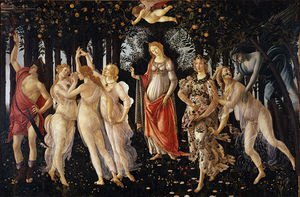 In other words, while shadow and contour is important, Botticelli seems to prefer in Primavera and The Birth of Venus a solidity of his forms. Though tempera paints enjoyed a remarkable longevity, artists outside of the Italian peninsula by the early fifteenth century, had grown tired of the medium's chief limitation of these coloristic effects. While tempera paint allowed rich color, it did not permit deeply saturated colors nor subtle tonal gradations. This limitation is what contributed to the solidity of forms seen in earlier paintings, but it did not afford artists the opportunity to convey subdued washes of color. So, even before Botticelli began works like Primavera and The Birth of Venus, Northern European artists started to experiment with oil paints. Earning their name as they are composed of pigment and drying oil, such as the most common linseed oil, oil paints afforded artists a new-found flexibility in coloring effects. One of the key pioneers of this new method was Netherlandish painter Jan van Eyck. Fascinated by the potential of oil paintgs, van Eyck worked with a relatively unprecedented meticulousness in the soft glazes of colors he built up upon the surface of his paintings. 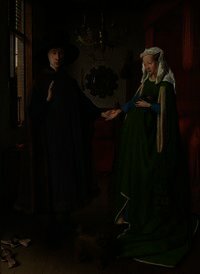 The result, as seen in masterworks such as The Arnolfini Double Portrait from 1434, is an almost luminous effect to his compositions' surfaces. Indeed, so "lustrous" were van Eyck's paintings that famed Italian biographer and early art historian Giorgio Vasari credited even Eyck with having created the medium. Predating works like Botticelli's by nearly half a century, van Eyck's use of oil paints reveals that the medium took hold in parts of Europe much earlier than in others; by the end of the fifteenth century, however, oils had become the main medium across the European continent. 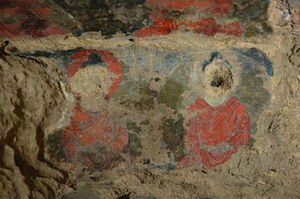 While Europeans have been credited throughout history with having developed and popularized the medium of oil paints, recent discoveries suggest that eastern cultures might have used the medium well in advance of their western neighbors. In addition to its longer drying time, oil paints unfortunately suffer the test of time much more poorly than paintings rendered in other media. Oil paints, for instance, are much more susceptible to discoloration and oxidation, which can cause compositions over time to lose aspects of their appeal. This would have been an unknowable characteristic during the early days of the medium's use, but it has encouraged a greater study of conservation methods to both preserve and restore the colors to their original glory. As a result, the popularity of oil paint remains unfazed, its only modern competitor perhaps the realm of the digital. ↑ Vytlacil, Vaclav and Rupert Davidson Turnbull, Egg Tempera Painting, Tempera Underpainting, Oil Emulsion Painting: A Manual of Technique (Oxford, New York, 1935), Introduction. ↑ Giacomo de Nicola, "Duccio di Buoninsegna and His School in the Mostra di Duccio at Siena." The Burlington Magazine for Connoisseurs Vol. 22, No. 117 (December 1912), pp. 138-139; 142-143; 145; 147. ↑ Raffaelli, J.F., "Solid Oil-Colors: An Innovation in Paints" Brush and Pencil Vol. 10, No. 5 (August 1902), pp. 297-298. ↑ Vasari, Giorgio, "Capitolo XXI:Del dipingere a olio in tavola e su tele. "Le vite de' più eccellenti pittori, scultori e architettori. 1568 edition. ↑ Morgan, Llewelyn, The Buddhas of Bamiyan (Harvard University Press, Cambridge, 2012). ↑ Agoston, George A., "Acrylics, Oils and Encuastic: Experiences and Opinions of an Artist-Chemical Engineer" Leonardo Vol. 4, No. 3 (Summer 1971), pp. 211-219. This page was last edited on 24 March 2018, at 22:39.